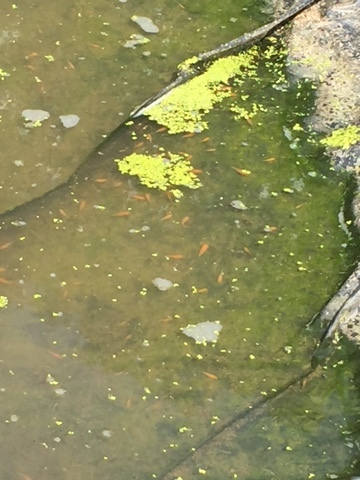 In the bottom pond outside; the original batch of hatchlings have almost reached harvest size. That’s an incredible growth rate – under 4 weeks from spawning! 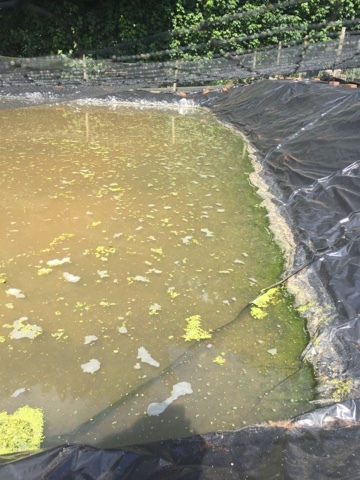 We topped up the bottom pond with the fry from the drained top pond; and I also topped it up further with a few thousand hatchlings that we were rearing indoors. 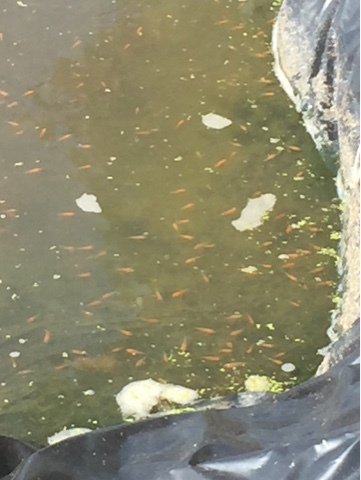 Its going to be interesting to see how all these batches of fry get on, considering the different sizes when I introduced them into the pond. 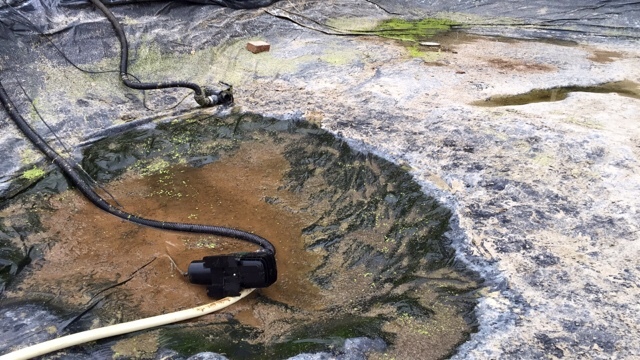 After draining the top pond, I used the pond vac with an extra length of hose to reach the drainage sink.. And hopefully avoid any repeats of the notorious 'loch ness shiro' situation from 2013. After vacuuming the last bits out, I washed the waste with water from the tap and vacuumed that too. The original ones are at first selection size… and the last batch I put in are still tiny slithers. So, we may drag the pond with the seine net this weekend to pull out the largest ones and continue to raise those indoors. And make that extra space and food opportunity to the small ones. And, while we’re lingering on good news…. The few fry from the ‘sharkey’ spawning that we’ve been raising in a black tub in the polutunnel; they are comfortably at first selectkion size and up until a few days ago, they’ve looked like goldfish. Orange, no patterns. But over the last few days, the plain orange has given way to emerging patterns and I’m holding back from my previous judgement on this parent set. It might be… that we get a few with patterns. Other news. A plague of ducks has struck once again. 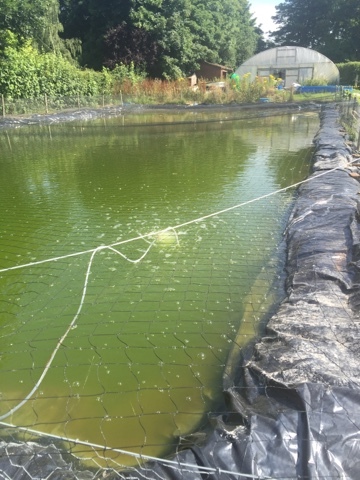 Another clutch of chicks have been gorging themselves on the daphnia (and probably the fry) in the bottom fry pond. We’ve tried to keep them out, but the chicks are small enough to get through the chick wire fencing.. In the end, we’ve resigned ourselves to suffering the losses. It’s a real pain – when you consider the challenges we’ve faced this year, and finally getting a decent number of fry into a fry pond, large enough to benefit from the daphnia, and with good daphnia bloom – and then we have this duck isse. Really – it’s just so frustrating. 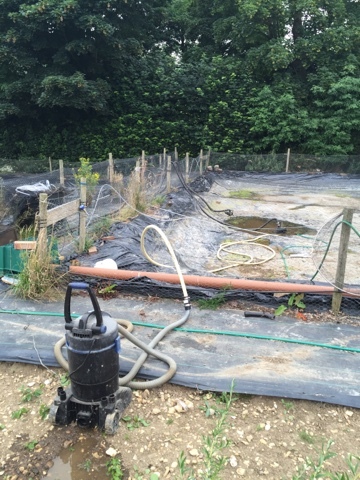 Yes, we can put up additional fencing with a tighter hole size… but we are simply at the end of the amount of effort we can put into the project. All we can do is sit and watch it happen. Amanda’s been doing a great job of trying to get them out of the pond as often as she can during the day. But we’re hitting limits in what we can do. New fencing will feature highly in any improvements we can plan in for the winter months. The other news is that we didn’t find enough time last weekend to run the 3 step spawning. Fingers crossed I will get to it this weekend. The top pond is almost fully refilled. So, the next task is to run another spawning and attempt to rear another batch of fry. Great blog, very interesting, how you find the time to do it all is amazing!